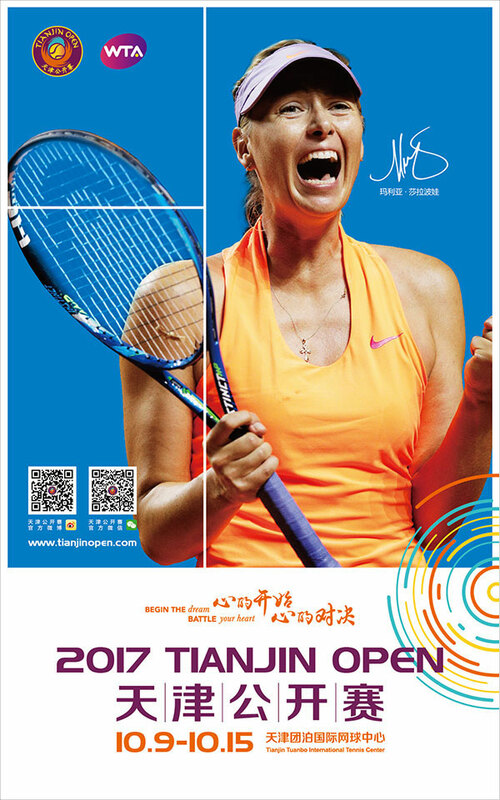 Thursday, 6th, JULY, 2017, Tianjin, China – Organisers of the Tianjin Open announced today that former World No.1 and five-time Grand Slam Champion Maria Sharapova will participate in her first Tianjin Open this October (9-15 October 2017) to be held at the Tianjin Tuanbo International Tennis Center in Tianjin's Jinghai District. Sharapova, a global superstar has claimed 35 singles titles during her illustrious career, including five Grand Slam Championships - Wimbledon (2004), US Open (06), Australian Open (08) and Roland Garros ('12, '14) – as well as spending a total of 21 weeks as World No. 1. The 30-year-old Russian is no stranger to tennis in China having captured the 2014 China Open in Beijing and is looking forward to again playing in front of China's tennis fans. "It has been great to be a part of the growth of tennis in China and seeing first hand how much work they have put in to create a great tennis atmosphere and environment for us to come and showcase our talents, especially in front of all the Chinese tennis fans who are really passionate about the sport now and watching us play," enthused Sharapova. Sharapova is also looking forward to visiting Tianjin for the first time adding, "It will be a new experience for me to visit another beautiful city in China, and in a city that has a growing tennis culture. I know that the tournament is just three years old but I have heard that they have developed a strong reputation delivering a high quality tournament and player experience. I am delighted to be playing there and look forward to seeing everyone at the Tianjin Open". The confirmation of Sharapova's participation continues to solidify Tianjin Open's position as the largest annual sporting event to be held in the city and continues to enhance its reputation for bringing world-class athletes to Tianjin. "Maria's participation in the Tianjin Open is a great result for all the tennis fans here in Tianjin. We have worked hard to build an event that everyone can be proud of and to have a player of Maria's calibre and profile join us for our fourth edition is a great achievement for our growing event," added Tournament Director Stephen Duckitt. The Tianjin Open is a WTA International Series tennis tournament offering USD 500,000 prize money and held at the Tianjin Tuanbo International Tennis Center in Jinghai District. The tournament delivers a world-class experience for players, fans, media, sponsors and officials. Previous winners of the Tianjin Open include Alison Riske (2014) Agnieszka Radwanska (2015) and Peng Shuai (2016).